The Bank of England has again expressed concern about the UK's buy-to-let property market. The Bank's governor, Mark Carney, said he was concerned about high levels of lending to landlords and that the Bank would take action. "There are a number of things happening ... we are watching it closely and we will take action," he told the FT.
Mr Carney said the problem was that investors might sell their properties at the same time if house prices fell. In September, the Bank's Financial Policy Committee (FPC) made a similar warning about the buy-to-let market. The committee, which is led by Mr Carney, said the growing market posed a threat to the UK's financial stability. "The stock of buy-to-let lending might be disproportionately vulnerable to very large falls in house prices," the FPC said. Since the FPC's warning, Chancellor George Osborne has announced that stamp duty rates will rise steeply for anyone buying a home that is not their main residence - which would include buy-to-let investors as well as second-home buyers. But with the higher rates of duty only starting at the beginning of the next financial year, there are worries that there may be a rush by some would-be landlords to buy properties before then, which might help to push up house prices even further. Lending to landlords has grown rapidly in recent years. There are now 1.7m buy-to-let mortgages, making up about 16% by value of the total stock of all outstanding mortgages. Each year, more than two million individual landlords declare rental income to HM Revenue & Customs in their tax returns. For the 2012-13 financial year, 2.1 million taxpayers declared income from property, up by more than a third from the 1.5 million in 2007-08. Earlier this year, Mr Carney said the Bank was in discussions with Mr Osborne about obtaining greater powers to regulate the buy-to-let mortgage market. So far, however, there is no word on what these powers might look like. The governor also used the Financial Times interview to defend his policy of "forward guidance" about the path of interest rates. In the past two years, he has suggested several times that the Bank would soon start to "normalise" the base rate, which remains at 0.5%. However, inflation has remained far below the target of 2%, prompting the Monetary Policy Committee to hold its fire. "Did I know that oil was going to fall 12% in the last 10 days? No, I didn't know that," Mr Carney said. Neither, he added, had the Chinese "given me 12 months heads-up" that they would devalue the yuan. "But I will continue to try to frame as accurately as possible what's guiding my decision process." The UK's inflation rate turned positive in November for the first time in four months, official figures showed on Tuesday. 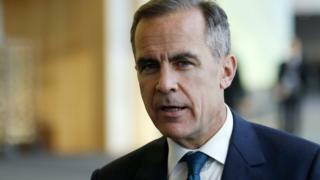 The US Federal Reserve is expected to raise rates for the first time in nearly a decade on Wednesday, but Mr Carney's comments indicate that the UK's central bank remains in no hurry to follow suit. The Bank has not altered UK interest rates for the past six-and-a-half years. Its annual survey of household finances found that almost a third of households would have to reduce spending, work more or alter their mortgage payments if rates rose by 2 percentage points without any increase in wages. The Bank of England research said that the government's austerity programme "has weighed on household spending, and it is likely to continue to do so".